The leaves are beginning to turn, but it’s summer forever when you have a Tiki drink in your hand. From classics to modern twists, these bright, often sneakily boozy drinks have been popping up across DC with much greater frequency in recent years. In fact, many bars are not only devoting certain nights or portions of their menu to the drinks, but the city is now blessed with a number of full-on Tiki bars and pop-ups. There’s a playful element to these drinks, with their oversized, embellished vessels and umbrella adornments, but the craft of making a true Tiki cocktail is no joke. But don’t take our word for it -- get out there and taste these for yourself. If you’re going to call your bar Archipelago, you better deliver the tropical goods. Thankfully, this U Street bar does so in spades. Founded by Owen Thomson -- a veteran of Cafe Saint-Ex, Bar Pilar, and Rose’s Luxury -- Archipelago goes all-in on island décor with bamboo walls, palm plants, and Tiki idols galore. 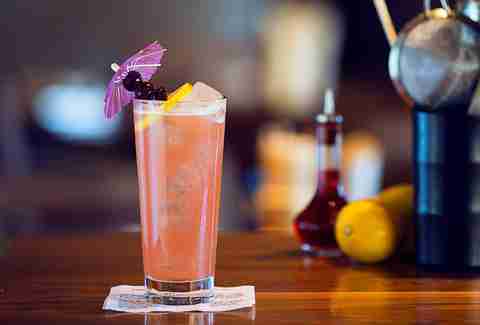 As far as its alcoholic offerings, this place offers up "some classics, some new drinks, but always Tiki." On the classics side of the equation, you can expect unadulterated versions of the Mai Tai, piña colada, and banana daiquiri. The new drinks, meanwhile, span from single-serving sippers to multi-straw monstrosities that serve three to four. Bring a date and go for the Pineapple of Hospitality: served inside its titular fruit, the super-sized cocktail purports to be made from only rum and "secrets," and it’s delivered with a flaming lime. 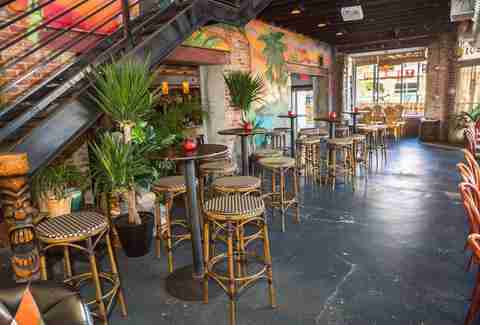 Let’s be honest, a modestly sized bar located in an English basement just south of Adams Morgan does not scream "Tiki." I live in an English basement, and the closest thing to aquatic life in this place is the occasional silverfish. But since Bar Charley’s earliest days, its eclectic drink menu has had a space carved out for on-tap Tiki cocktails. That’s right: on-tap. That’s mean no extended wait times while a bartender carefully combines multiple liquors, syrups, and juices. (Nothing but love for the mixologists of the world! Keep up the good work!) The most popular option is Molokai Mule, which brings together light and dark rum, brandy, orgeat, orange juice, lime, and bitters inside of a kitschy ceramic hula woman glass. 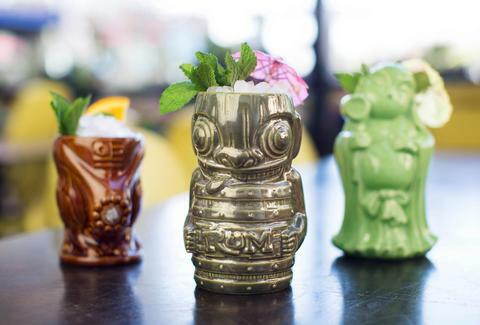 Head there on Monday nights for $5 Tiki Taps... and kiss your Tuesday productivity goodbye. barmini’s cocktail menu comes bound in a shiny metallic case, thick and overwrought, like a 15th-century Bible. Contained within it are over 100 innovative, playful, and often deconstructed recipes… some of which happen to be for pretty swanky Tiki drinks. One’s a take on the classic Painkiller, a cousin of the piña colada made with spiced rum, pineapple, orange juice, and coconut cream. On the wilder side, there’s a tongue-twister called "Mohan Travels to Peru and Gets a Haircut," which features rum, pisco, chicha morada, lime, ginger syrup, walnut liqueur, and rosemary "mohawk." (When you see the Tiki idol glass, you’ll get it.) 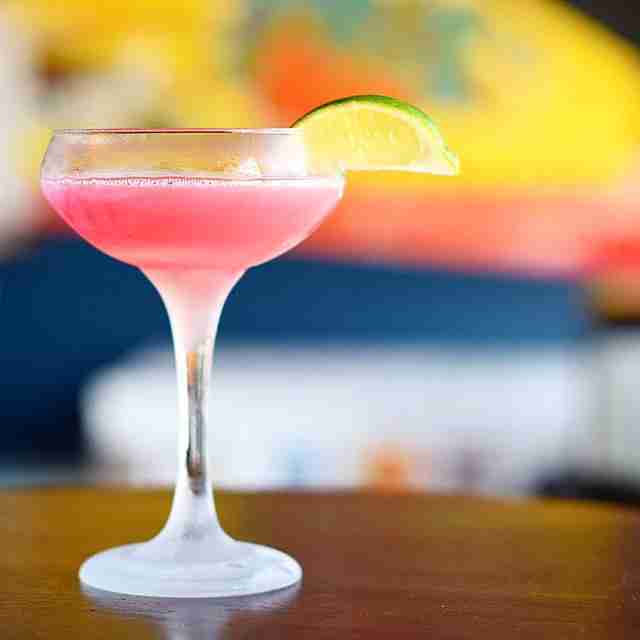 If a few Tiki options aren’t enough for you, this José Andrés joint hosts a Tiki Week during the month of July. There are bars that dabble in Tiki, and then there’s Farmers Fishers Bakers. Beverage director Jon Arroyo has constructed such a Tiki-centric cocktail menu that I think he might own stock in rum and citrus. Most notably, the Georgetown property slings vivid interpretations of Zombie and Mai Tai recipes plucked from the Tiki heydays of the 1930s, ‘40s, and ‘60s. There are also piña coladas, daiquiris, Caribbean swizzles, and "Throwback Tikis," and I caught a sugar high just typing all of that out. All in all, Farmers Fishers Bakers has over 25 different options from which to choose, and if you enjoy sipping from its signature Tiki mugs, hell, you can buy those, too. If you’re going to grab a drink on the Waterfront, you might as well do it right. Dram & Grain may sound like the name of a Soulja Boy song, but it’s an intimate, leather-clad, and achingly hip speakeasy tucked in the basement of Jack Rose. It’s also one of DC’s very best bars. The current fall offerings of the Adams Morgan spot each draw inspiration from one country around the world, and none of them should be missed. But if you’re looking for a one-of-a-kind Tiki cocktail, you can’t go wrong with “Off the Coast of Hanauma Bay.” For starters, the communal cocktail -- as in, you’ll need at least one partner -- comes served in a ceramic treasure chest. The booty inside consists of rum, toasted coconut orgeat, falernum, and bitters. And, of course, it’s delivered with a rum-and-absinthe-soaked lime that’s been set ablaze. Reservations for this place are a pain (you have to text a number, and you’d better do it far in advance), but it’s worth it. If you feel like having a Tiki drink on a whim, head to the top floor of Jack Rose and visit the outside Tiki Bar, though that’s only open seasonally. You may be picking up on a theme here: sometimes the best Tiki drinks are made at places where you can’t always get them. Or, at least, you have to know to ask for one. H St’s Copycat Co. sometimes does full-on Tiki nights, but regardless of when you’re at the cocktail bar, you should ask for the Zombie. 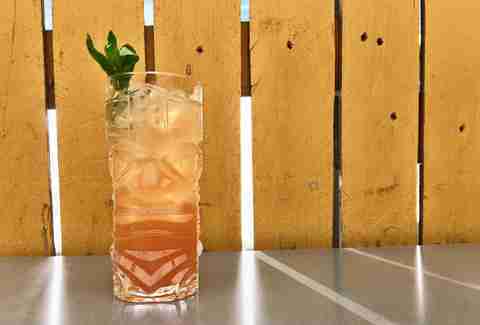 Its version of the 1930s drink is renowned for its potency and beguiling "zombie mix." The adult beverage list at Doi Moi traffics mostly in wine, but its few cocktails draw inspiration from the Tiki canon. Most notable: the refreshing spin on the Zombie, which brings together three types of rum, passion fruit, pineapple, lemon, lime, and Angostura bitters. More variations of Tiki drinks can often be found underneath the Southeast Asian restaurant, at one of bar director Adam Bernbach’s other libations projects, 2 Birds 1 Stone. Philip Runco talks to people who make beer and music. A lot of these conversations end up on BYT. Follow him on Twitter @PhilRunco, on Untappd @prunco, and on Untikd as @RumRunner73.